I have a strong distaste for database connection management. All I want to do when I want to query one of our many databases at work is to simply supply the query, and package the result into an R data.frame or data.table. R has many great database connection tools, including but not limited to RPostgreSQL, RMySQL, RDJBC, ROracle, and RODCBC. I set out to consolidate all of my database querying into a simple function, and I have succeeded for my purposes. I can connect to my company’s MySQL, Postgres, and Oracle databases with ease with my fetchQuery function, defined (in conjunction with it’s dependencies) as follows. #' @param verbose Should the queries be printed as they're made? #' @param split Should the queries be split on semicolons, or run as a block? #' @return A list of results if multiple queries, or a single result if one query. Notice that the drv (driver) argument can be either an actual driver, or a character string of the driver type. My reason for this is that some driver initializations require multiple parameters, while some only require a single one. This could be made elegant by using a do.call argument, as defined in makeCxn above. Sometimes I want to run a bunch of queries all contained in one character string to my databases. This function will either split those queries by semicolons, or run them all in one batch depending on what you ask it to do. The advantage of the former is you will have diagnostics for each of the intermediary queries (temporary table creations, table deletions or inserts, …). I usually want to see how my query is doing as it’s running, so I provide a verbosity option. fetchQuery attempts to auto-detect whether you’re doing an insert or deletion or selection, and returns a result appropriate to the operation. This algorithm is simple, crude string-matching at this point, and i’d be happy to see an improvement. It hasn’t been a problem for me yet since I am very consistent in my sql syntax. The connection fortunately gets closed no matter if the query is in error or not, which is really nice for me and my company’s DBAs (R will limit the number of active database connections you can have open, so it is important to close them). This entry was posted in R, Statistics and tagged database, MySQL, Oracle, Postgres, R on July 27, 2013 by Erik Gregory. I’ve just released my first R package! Over the past 1.5 years or so, I’ve been studying an obscure statistical model over ranking (full, or partial) data called Mallows’ model. It hypothesizes that a set of sequence data has a “modal” sequence about which the data cluster, and that the data fall away from that modal sequence with probability , where is derived from the data. There is a closed form solution to determining the parameter and the modal sequence, as outlined in my third reference in the package manual . However, we often have data that are heterogeneous, and it makes more sense to hypothesize multiple modal sequences. That is where this package comes in. The RMallow package can take any set of sequence data of reasonable size (currently I have gotten it to process data sets with 2000 + rows and 20 + attributes in under a minute), and fit a Multi-Modal Mallows’ Model to the data using an EM algorithm as described in my first reference in the package summary. Certain conditions have to be met for the model to fit very well. For example, if there happen to be multiple modal sequences, but they are very close together (as determined by a distance metric called Kendall’s metric, which is equivalent to Bubble Sort in a way), Mallows’ model may simply group them all into the same “cluster.” Here is an example where I fit the model to some crude synthetic data, and discover two constructed modal sequences. The sequences are no more than distance 20 apart (the maximum possible distance in this space is 20*(20-1)/2 = 190), and it still groups the data very well! The idea of the construction of the data in the following is that we create two modal sequences for the code to find. I then construct a good number of identical sequences to the modal ones, and randomly transpose between 1 and 10 of the elements of each (uniformly, which I stress is NOT how Mallows’ model works…). I then add a good deal of noise in partial rankings (rankings where there are no full orderings between certain groups). The final call is the code to fit the model. Now for the moment of truth, to determine whether the code found the sequences. The output is a list, where the first element is the modal sequences found, second is the proportion of data assigned to each cluster, third is the cluster membership probabilities for each row, and fourth a data frame with the data, probabilities of cluster memberships, cluster assignments, and distance from each modal sequence. GREAT SUCCESS! I purposely did not set a seed here because when I ran the code above, it actually did not produce what I was hoping for. I DID get that output when I ran a function I will put into the next release, which runs the algorithm several times and selects the best fit, based on the log-likelihood of the data in the model. EM Algorithms are prone to local maxima, so this is a necessary fix. You may very well get the output above when you run that code on your machine, depending on the state of your system. If not, try running it 5 times or so and it will most likely work out! So there we have it. I have demonstrated that this package has some value in mining patterns from sequence data with noise. I will be working on implementing some solutions to increase the probability of convergence, and trying to extend the model to larger sequence spaces soon. Also, I will be providing a Goodness Of Fit Assessment of the model, when our data satisfies certain conditions (sample size, …). Finally, I hope to soon be able to demonstrate the value of this model in real-world data in my next post. This entry was posted in cipher, R, Statistics and tagged data mining, machine learning, R, statistics on February 22, 2012 by Erik Gregory. I came across Dr. Peter Norvig’s blog about writing a basic spell-checker (http://norvig.com/spell-correct.html), and just had to try to implement it in R. Please excuse the ugly-ish code (I have not optimized it or commented it adequately at this point, but you can get the idea of what it does by reading Dr. Norvig’s blog). If anyone knows of any pre-built spell-checker packages in R, please let me know in a comment! # borrowed from a CMU Data mining course professor. # Words within 1 transposition. # All Neighbors with distance "1"
# Probability as determined by our corpus. # Correct a single word. # If it is a word, just return it. # Otherwise, check for neighbors. # Which of the neighbors are known words? # If no neighbors still, return the word. # Correct an entire document. The above functions generate “neighbors” of words, determine probabilities of the neighbors, and return the best ones. Function “CorrectDocument” will correct an entire document (with special characters and punctuation removed), and “Correct” will simply correct a word. Here are some sample runs. "Having a hard time matching 'korrecter'..."
 "the quick brown fox jump over the last dog"
As you can see, this function is obviously not perfect. It will do some basic corrections automatically though, but there are some improvements to be made. More to come! This entry was posted in cipher, R, Statistics and tagged data mining, machine learning, R, statistics on February 8, 2012 by Erik Gregory. In a basic Metropolis-Hastings algorithm, it is relatively unlikely that we will jump to states of the system which decrease our cost function (note: we usually try to decrease the cost function, but in the code below our goal is to maximize it instead). The algorithm greedily tries to attain a maximum value of the cost function, and thus is very prone to hitting local maxima instead of the global one. In contrast, when we use simulated Annealing methods we are much more likely to jump to “worse” states during early iterations. This is because in the early stages, we want to jump around the sample space and try to find where the global maximum will occur. We can also build a characteristic into the algorithm which will “cool-off” as the algorithm iterates. What I mean by this is that our likelihood to jump to “worse” states will slowly decrease as the algorithm iterates. In a standard Metropolis-Hastings algorithm, we jump to state with probability , when . In my Annealing Method to decode a cipher, I first fix a temperature , and move to state with probability when , where is the number of iterations and is the current iteration number. 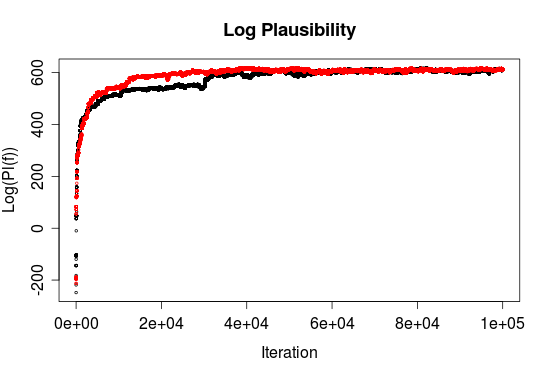 The reasoning behind this acceptance probability is that at first, we are basically multiplying the acceptance probability by , and by the end we are basically not changing the acceptance probability at all from . Try plugging in , and for to verify this. The result is the following transition probability function, which can perform both the Annealing and Metropolis-Hasting probability calculations. # Function to calculate the transition probability. An additional variable that I added was a method of changing neighbors. In very large sample spaces, it can take a lot of transpositions to move from one state to another. In fact, the furthest state from any given state is , where $n$ is the length of the permutation. In our case, that is 1326 moves. The chance that the previous algorithm would get stuck in a local maximum en route is very high. We combat this by allowing the neighbors of any particular permutation to be farther away. Consider the following neighbor-generating function. # Function to generate a new candidate function. #  f: the function we want to find a neighbor of. #  top: the maximum number of elements to transpose. # Which elements to switch? We supply the function with the maximum number of elements, , it is allowed to transpose, and it decides to transpose between 2 and elements, at random (uniformly). It then decides on a random ordering of that transposition (there are a lot of ways to move around 10 different elements, for example). The function has a check to ensure that it does not simply output the same function as was input. Another idea I came up with to allow the algorithm to zero-in on a good solution was to make the algorithm start doing single-transpositions eventually. This allows us to fine-tune our “good” solution in the later iterations of the algorithm. In the code, we use the “attack” parameter to determine how quickly we begin our fine-tuning of our solution. Small values of “attack” correspond with a lot of jumping around throughout the iterations, while high values correspond with us fine-tuning our algorithm earlier on in the iterations. The result is our final algorithm-decoding function. # Number of characters in the message. # f will be 'permanent', fstar will be a guess. # and of the current state of the system. # random numbers at once, since they are independent. # Keep track of the best over-all guess. # of the decoding candidates. # Generate the "top" input for the Neighbor function. # and initiate next pl.f value. Here we read in the data, and format the transitions matrix (to prevent infinity and 0 values of the plausibility function). k e   i n c e n f   c o   y e g i n   o n   c h e   w i s t c   o w   w e y s u a s "
We get the following graph of the Plausibility, for each method. The black is the Annealing method, the red is the Metropolis method. a v e   p e a c e ! a k e   p e a c e .
In this case, the Metropolis method seems to have found the better decoding. But that is not necessarily the point. The goal of the Annealing method is to avoid local maxima, and it was successful in that pursuit (as evidenced by the readability of the message). I have had varying results with both methods, depending on parameter inputs. It is not clear which one is better of these two, and I do not have the computing power to benchmark them. In any event, there is probably some fine-tuning of the parameters that could be done in order to improve the efficacy of the decoding methods. They do seem to both come close to the correct message more often than the code in my last post. This entry was posted in cipher, R, Statistics and tagged data mining, machine learning, R, statistics on January 1, 2012 by Erik Gregory. My friend introduced me to a web site for a data mining course at Columbia, and I have been pretty hooked on some of the projects. One of the most recent ones I’ve worked on was decoding a simple cipher, using a Metropolis-Hastings algorithm. It is a pretty amazing little technique, which jumps around the sample space of 51! possible substitutions (something like 10^66 possible choices) and yet still quickly converges to a hopefully decoded version of the message. I finally got it to work, and the code runs in around 15 seconds. Check it out. # and of each individual guess. # The current test of the decoded message. # matrix containing the transision probabilities/frequencies. # in the transition matrix. # Record the new plausibility. # at decoding the message. It makes sense to eventually add some capability to test whether the algorithm is jumping around properly (is the probability of f changing?) and to start the chain at different points, since this algorithm is not guaranteed to converge. It may reach a local maximum, and never get to jump to the final solution. The following code scans in the data, and formats the transition probabilities using the log p-value and a little bit of Laplacian smoothing. And here is a sample call of the function, with output. It prints out the best decoding every 10,000 iterations, and will stop trying if the message doesn’t change at all for 30,000 iterations. It doesn’t always work like you would hope, but here is the original message, followed by our decoded version. Note that in the final version, the algorithm decided that “d” and “g” should be switched. ; r c 3 3 k c . o ' r   . r t * ' r ;   3 3   , k . ( r n c d k d l r 1 c z ' r , c ! r t   ( ' t * ' ! 8 r 1 c z ' r e ' c o ' r t   ( ' t * ' ! 8 r ( ' . ' ! 6 d r ; k .
c ! t r t * c t r 1 ' / k o   r k d r t   r ! ' o   . m 6 ' ! r t * ' r 3   d t r t ' ! s s r t * ' r d 6 ( ( ' d t k   . r t * c t r * ' r d *   6 3 s 8 r   . r * k d r   , . r k . k t k c t k h ' 8 r k . h k t ' r ) c e c . r t   r k 1 1 ' s k c t ' r c s * ' ! Although this is a simple type of cipher that could be done quite easily with simple frequency analysis of the characters, the method is an interesting one. This entry was posted in Uncategorized on December 4, 2011 by Erik Gregory.